Summer time is finally rolling around, even though we've still had lots of spring showers here in the Bay Area! We've had some chilly days, but each time the summer sun decides to shine, I find all the inspiration I need to get my BBQ/grillin' hat on. Because who doesn't love a paper plate of perfectly grilled meat with some cool, refreshing sides? And once you've got your ultimate summer plate stacked up just right, there has to be a sweet treat to finish it off - am I right? 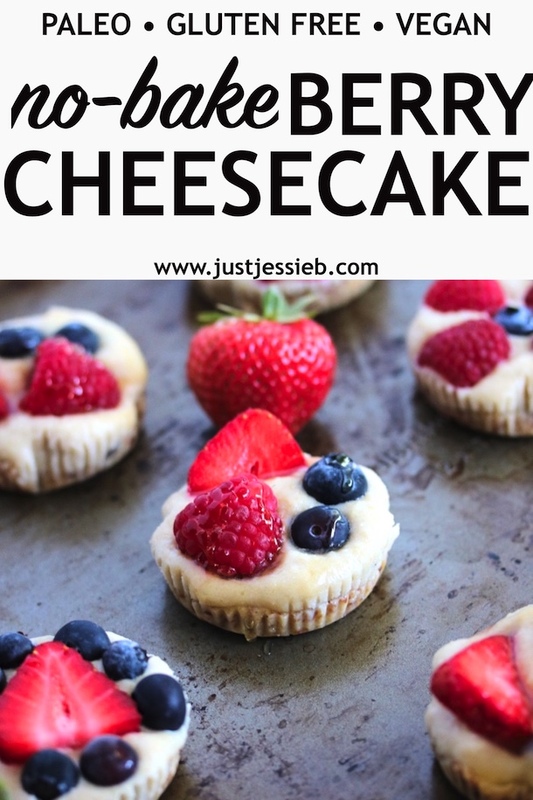 My mission was to come up with a cool, creamy treat - perfect for topping off those summer nights - that doesn't require heating up any household appliances. Because you know that heating up an oven is not always the most welcome idea when the house is already warm! The other part about a no-bake treat is the simplicity factor. 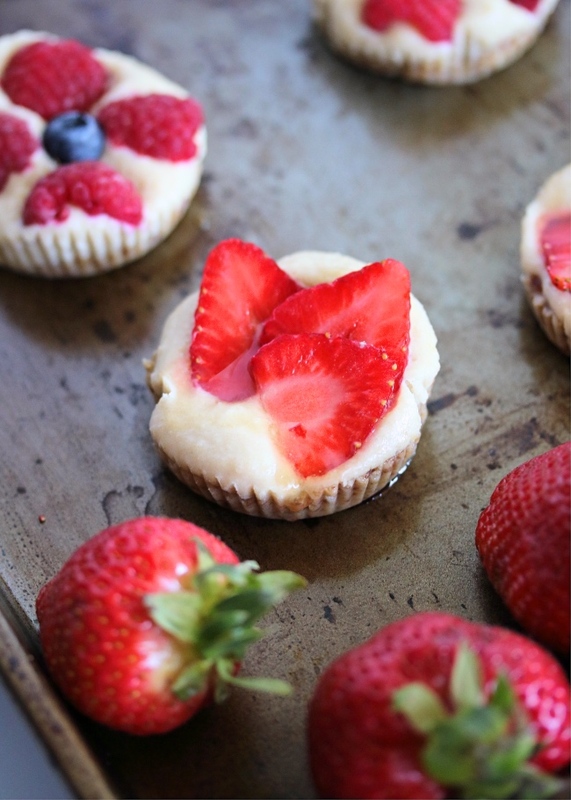 Simply pulse the layers of these tasty tarts: first, the crumbly crust; then, the creamy "cheesecake-like" layer. Top with your favorite berries and a drizzle of honey, and your dessert is done. It sets in the freezer and can be stored in the fridge for whenever you're ready to reveal your delicious treats! While the flavors are enough to sell just about anyone on these, the look of them is also enough to tempt you! You can get creative with your berry toppings, making whatever design you like - and even changing out the fruit for different flavor combos. 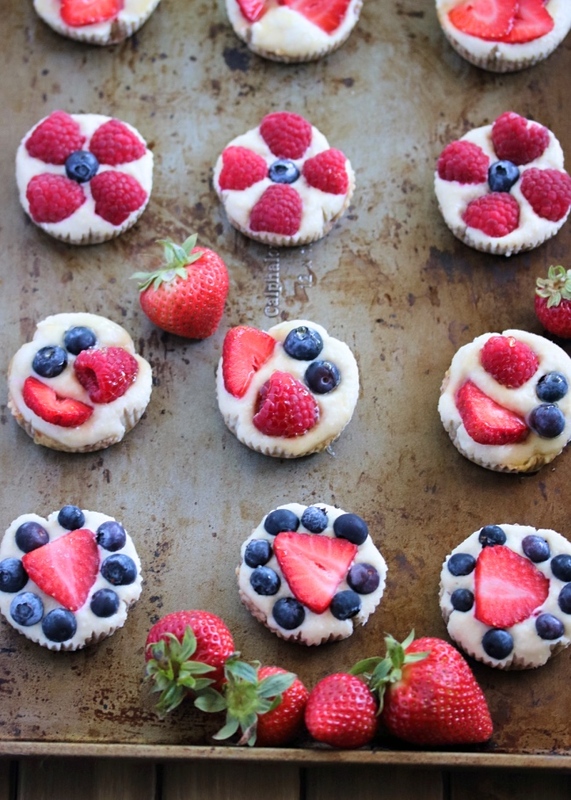 I have to admit though - the berries are not only delicious, but super pretty & fun for 4th of July! Because these are so easy to make, I've already done them several ways. One of my favorites was as a plated gift for friends who just brought home their brand new baby boy. 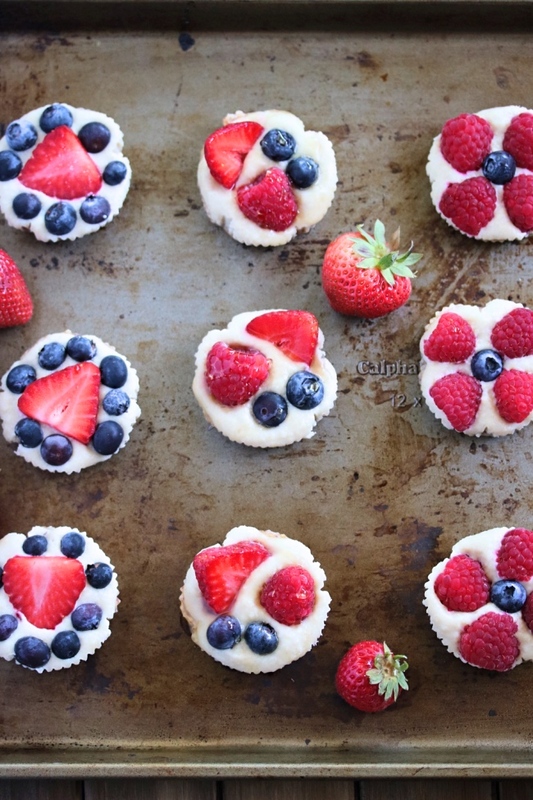 I made a center tart with a big "A" made from a strawberry (just using a small, sharp knife) and decorated the tarts around it with a mix of berries. These are so much fun, you guys! And would be fun for the kids to help out, too. In a food processor, pulse the crust ingredients until a "dough" consistency forms and the dates are chopped fine. Line a 12-cup muffin tin with paper cups, then scoop about 1 Tbsp of the dough into each cup. Use your fingers or the back of a spoon to press the crust into the bottom and slightly up the sides. Rinse out the food processor, then work on your filling. Combine all of the filling ingredients, pulsing until super smooth. Spoon the mixture evenly into each of the 12 cups. 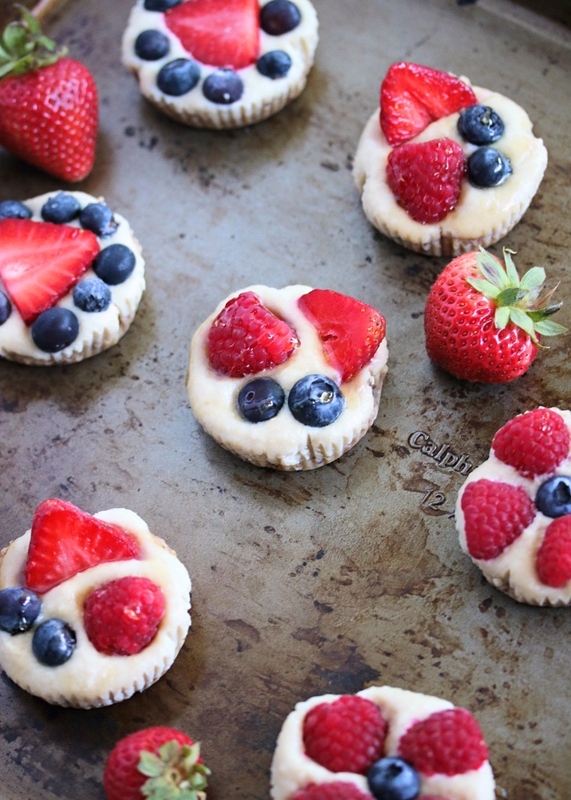 Top with fresh berries, arranging them as you like. Drizzle lightly with honey or maple syrup. Transfer the tarts to the freezer for about 1 1/2 to 2 hours, or until they are firm. Store in the refrigerator. Serve chilled. If you're trying to keep these vegan-friendly, stick to maple syrup in place of honey. For the coconut "cream", just scoop the thick stuff off the top of a can of full-fat coconut milk. I love these! 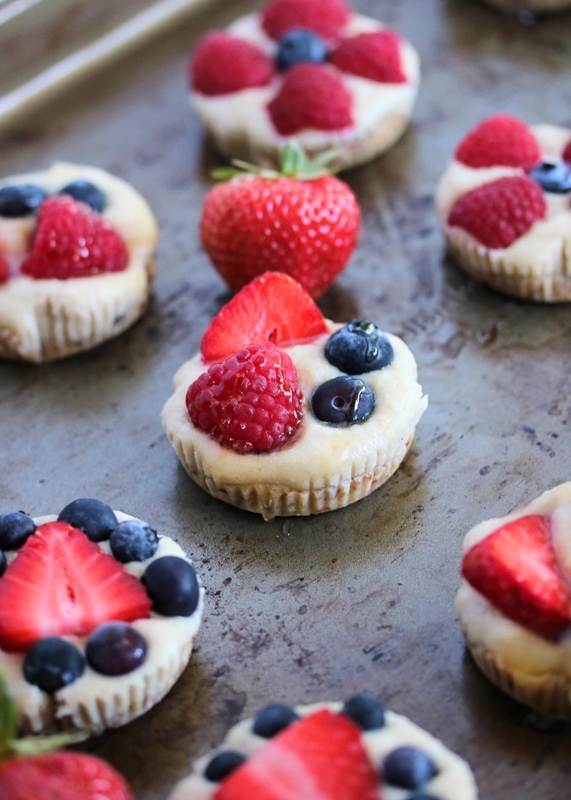 They are so perfect for the summer (YAY for no-bake!!) and even better for 4th of July weekend! I just made this tonight for the first time, and it is so good. I will no longer buy it in the mornings before work.